How to Get Rid of Black Stains on Teeth? Black stains on the teeth can be removed. Figure out the reason for the staining, and seek proper treatments to get your pearly teeth and bright smile back. The troubles of Black stains aren’t limited to our Foreheads and Cheeks. Spotting Black Stains on Teeth are likewise a common concern that results from bad oral cane and maintenance. 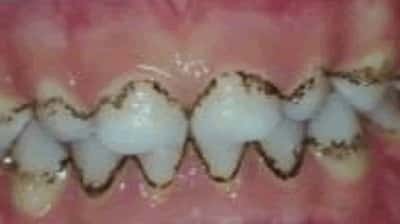 These Dark Brown to Black Stains on your teeth can be triggered due to different reasons, the most common being intake of too much sugar items and cigarette smoking. These spots can happen anywhere on our teeth — noticeably on the front teeth, between teeth or on the back. The discoloration is not just awkward but likewise unhealthy and needs to be treated right away. If the coloring has actually occurred recently then it is possible to treat it at home with a couple of simple ingredients. For extrinsic stains bring on by consuming coffee, tea or in case of bad habits like smoking or drinking alcohol the following home remedies can be followed. Salt is the best way to keep your teeth clean and free from tartar or calculus. Rub Sea Salt on your teeth, brush them on the front & behind of your teeth and swish them prior to washing it off. Using little amounts of Baking Soda with Lime Juice to remove the stains. Run the inside of an orange peel on your teeth. Some methods to prevent these black stains on your teeth are discussed below. Use a straw while drinking caffeinated beverages. Wash your mouth after consuming sweet products. Prophylaxis is normally suggested two times a year for the “typical” healthy adult patient. Prophylaxis involves cleansing mineralized build-ups of bacteria-rich food (referred to as calculus, or tartar). In some cases these stains become really difficult to remove and needs the assistance of a Dentist to repair the staining. Removal of stains is a really simple process and can be done at your practical time. Book an appointment with us now and consult our expert Dentist on your treatment alternatives.